This is a mini-canvas that I am entering into the Simon Says Challenge. The challenge was to use a Tim technique. I went a bit mad on the techniques here. I have stamped clocks all over the canvas, then painted a large portion of the central area with crackle paint. I then masked areas with the clocks and cogs masks and inked with distress inks and a blending tool. I then die-cut the little rainman figure with grungepaper, shiny card and plain card. The grunge man was painted with black paint and sprayed with Perfect Pearls mist, (heirloom gold). On the plain card I inked the man with vintage photo and the blending tool and over-stamped the sentiment from the set using the same ink. 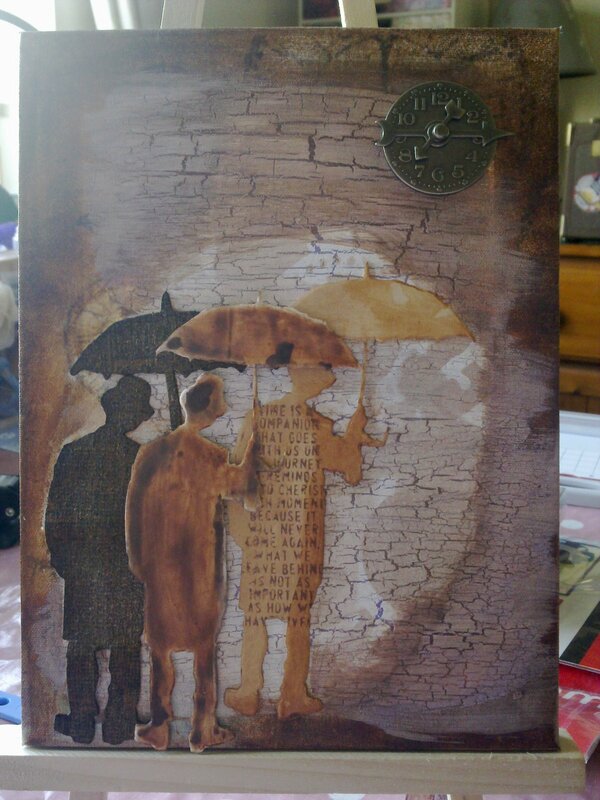 I edged one side with vintage photo distress stain. On the shiny card I just ran the vintage photo and walnut stain distress stains over the top and got this lovely effect, sort of like a colour wash. I ran around the edges with vintage photo distress stain and finished off with a little clock in the top corner. Sorry the photo isn't great, I can't find my camera charger anywhere and had to use Hubby's phone. Oh this is so cool! Three umbrella men and you know I love them! The crackled background is the perfect setting. Love this! I am now following you and want to thank you for the most kind comment on my blog! Have a great weekend! Great project and love the techniques! Thanks for joining the challenge at Simon Says Stamp & Show. Cool canvas! Love the repetition in different textures! Love the grouping of Umbrella Men... what a cool idea!